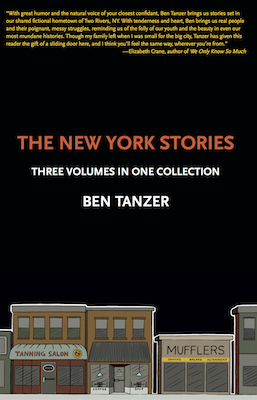 The New York Stories, a new fiction collection by Ben Tanzer, is a three-part book filled with tales from the same small town in upstate New York. With some recurring characters and ever-more-familiar settings, the stories are closely intertwined and become increasingly dramatic as the book progresses. Part 1, “Repetition Patterns”, begins with a somewhat unexciting but appropriate story of a presumably middle-aged man cycling through shrinks. He can never stick with one because eventually he finds their personalities too abrasive. As the collection continues, stories alternate between plots that contain the drama of an entire neighborhood, or high school class, or simply detail the lives of a couple of isolated characters. In “Life as He Had Known It,” a pair of new parents struggle to deal with their baby. In “Shooting Stick,” a man and his father bond over a game of pool. Stories overlap when different characters frequent the same places, such as “Thirsty’s”, the go-to bar. Part 1 includes many memorable protagonists. In “The Gift,” for example, we meet Fern, a bright and quirky girl who is obsessed with recording and organizing sounds. “Fern liked sound, all kinds of sound…a trait she was sure was a gift bestowed on her from some higher power,” Tanzer describes the girl’s passion. Although Fern has a manic pixie dream girl flavor about her and her tale arrives at a rather sad conclusion, the presence of several female-centered stories is refreshing in an otherwise male-dominated collection. Tanzer has obviously made an effort to include a range of protagonists in terms of age and gender (although not race). The issues and situations that all of the characters face feel very real, whether someone’s father is dying, a teacher is promiscuous, or cheating spouses are making the rounds through the neighborhood. In Part 2, “So Different Now”, Tanzer tightens the connections between his characters, offering enhanced clarity. The stories continue to take place in the same small community, and there are even some recurring personalities, such as J. the therapist. J. plays a minor role that allows the reader to see further into the narrator’s mind both times he appears. Tanzer is an efficient storyteller, and readers are never left wondering who is who, or how two people know each other. Some of the characters, however, fall flat, such as Stacey and her sad little sister Jessica (from a story titled “Stevey”). Stacey is described as “ravishing, like a fire gone crazy with her tremendous mane of red hair.” Despite such vibrant descriptors, the sisters both play a passive role when Stacey is revealed to be a victim of domestic abuse–rather than taking any action, they both sit back and let it happen, letting the reader down. Revenge, violence, and missed opportunities are major themes running throughout Part 2. But overall, a sense of apathy and perhaps even hopelessness prevails. In “Goddess,” the narrator actively decides not to help a damaged woman, “No Nothing” ends with the promise of a violent beating, and “Just Like That” highlights the tragic frustrations of a wild drunk. The smatterings of humor and positive endings dwindle as the reader plunges onward to the aptly named final part of the collection. By Part 3, After the Flood, readers may begin to tire of the repetitive diction in this, the longest section of the book. When the small town is inundated with rain, causing a flood, the phrase “the storm of the century” is used in nearly every story, establishing a contiguous setting. While the text can drag on occasionally, the stories and scenes are richly dramatic. Readers will enjoy Tanzer’s sprinkling of science fiction intrigue. One very compelling story about a covered-up murder begins with “One minute there isn’t a body stuck to the front grill of your car and the next minute there is.” Another takes a very unexpected turn, suggesting the presence of a zombie, an element that is quite out of character (but very welcome) considering the realism dominating the rest of the book. At times, Tanzer’s diction and sentence structure challenge readers to decode his meaning. There are also a few hiccups in the text that will likely annoy some readers. Small inconsistencies, inaccurate word choices, and shifting tenses disrupt the illusion. Similarly, occasional phrases can trip readers up, such as categorizing a stutter-like speech disorder as a “lisp” or a person’s hands as “pink as a manatee.” The author’s intended sentiment and the image conjured in the reader’s mind may sometimes be at odds—for example, a “soft, crunchy first kiss” doesn’t match the tender fantasy that accompanies this phrase. Why is the kiss crunchy? Nonetheless, Tanzer writes his narrators well, offers plenty of sharp, readable dialogue, and has organized the book in such a way that it is easy for readers to navigate. At heart, this is a collection focused on the intricacies of human relationships. Many readers will relate to and appreciate the small town setting, although they’ll likely be eager for some more worldly experience when they finish. The New York Stories is entertaining throughout, and short fiction aficionados won’t be disappointed.